Congratulations! You’ve learned that you’re responsible for managing Hazard Communication (HazCom) for your company’s chemical inventory. That’s a huge responsibility, but it’s also a great opportunity to improve workplace safety and become an EHS leader. You might feel overwhelmed. We get it – we’ve all been there before. It can be difficult to even get your bearings in the world of HazCom, because the Standard itself is difficult to understand in isolation, and guidance materials are scattered. To help you on your HazCom journey, we’re providing you with this introduction to HazCom. We hope that reading this introduction will reduce your anxiety and help prepare you as you begin your HazCom journey. For purposes of introducing this topic, we'll be focused on OSHA requirements within the United States in this first post. Future blog posts in this series will delve deeper into the nuances of HazCom management, but for now, consider this a survey of the road ahead. Let’s start with the basics. No matter what kind of company you work for and what its primary business activities are, you most likely have chemicals in your workplace. They might be housekeeping chemicals like floor cleaners and paints, maintenance chemicals like oils and lubricants, or process chemicals like acids or solvents used to manufacture a chemical product. You might find these chemical products under the sink in the breakroom, in a drum in a chemical storage cabinet, or on a table right in the middle of a workstation. Chemical products can be dangerous for a number of reasons. Often, they have physical hazards, which are basically hazards inherent in the properties of the chemicals themselves and possible consequences of use or storage. They might be flammable, like many common solvents such as acetone or isopropyl alcohol are, for instance, or explosive, like nitroglycerin. There are also types of chemicals that react strongly with certain other chemicals, including oxidizers like potassium permanganate, which can react strongly with chemicals such as glycerin – even to the point of producing flames! Another common physical hazard is compressed gas, commonly found as canisters of propane for fueling or tanks of welding and blanketing gases such as acetylene or argon. Other chemicals are health hazards, because exposure to them can result in acute or chronic health effects. They might be corrosive, like strong acids (hydrochloric acid, sulfuric acid) or strong bases (sodium hydroxide, potassium hydroxide), which can damage body tissue upon contact. Some chemicals such as arsenic are acutely toxic, meaning that a single dose or short exposure can result in serious health effects, or even death. Finally, different types of chemicals can cause a range of health symptoms from short-term or long-term exposure, including respiratory tract irritation, skin sensitization, narcotic effects, or irritation to the skin and eye. Finally, chemicals that are environmental hazards can adversely affect the health of organisms or humans if they enter aquatic environments, such as rivers and lakes. 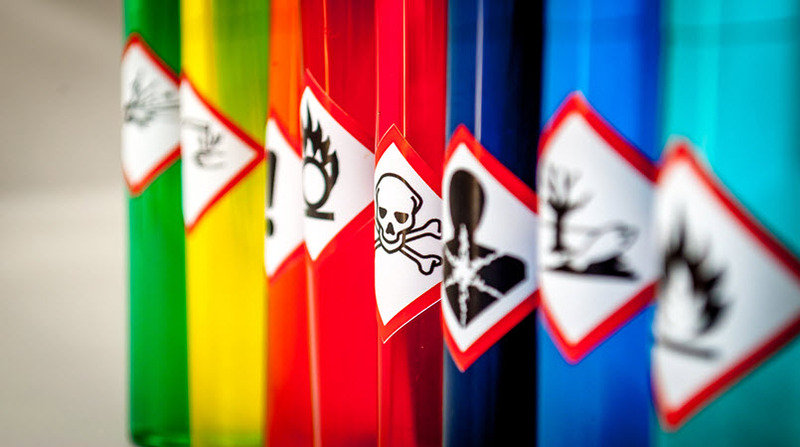 It’s important to realize that it’s not always obvious how to flag the dangerous chemicals in your workplace in the absence of detailed hazard information. For instance, you can get dangerous chemicals from many sources, not just from major chemical manufacturers or suppliers. For example, if you go to a hardware store, you can usually buy “muriatic acid,” which is the trade name for a product containing hydrochloric acid, which is an extremely corrosive acid capable of eating through plastics and metals – as well as your own skin and flesh! Dangerous chemicals often also don’t look any different from any other chemicals. In fact, many highly toxic liquid chemicals are clear and therefore can look much like water, and can cause serious injury or death in the event of accidental ingestion. Many solid chemicals are white and granular in appearance, and can be mistaken for more innocuous materials like sugar. This actually happened at a restaurant in a 2014 incident in which a restaurant employee added some of the caustic cleaning chemical lye to a batch of iced tea, because it looked like sweetener and had been in an unlabeled container. The customer who drank the iced tea containing the lye suffered severe burns to her esophagus and mouth as a result and very nearly died from her injuries. The important point here is that you can’t protect yourself, or your employees from the effects of exposure to these chemicals unless you have accurate information about their hazards. You also can’t effectively plan your emergency response procedures in the event of a spill, explosion, fire, or other chemical accident. That’s why it’s so important to get HazCom right. We can understand the importance of HazCom even more by recalling the time before the Standard existed. Prior to HazCom, many facets of chemical safety fell under the general duty clause of the original Occupational Safety and Health Act, which states that employers must provide their employees with employment and a place of employment which are free from recognized hazards that are causing or likely to cause death or serious physical harm.” The problem was that employer responsibilities weren’t clearly defined, and that even the most well-intentioned employers couldn’t adequately protect the safety of their employees if manufacturers didn’t provide them with accurate information about chemicals with shipments. Unfortunately, many employees in those days simply didn’t know what chemicals they were working with, much less how to safely handle and store them. Because chemical hazards were poorly understood, if at all, employees also were unable to use proper personal protective equipment. As a result, many of them suffered long-term health effects, such as respiratory illnesses and memory loss, or even fatal diseases such as cancer. It was dangerous to work industry jobs involving chemical exposure back then. As OSHA became increasingly aware of the danger, they saw the need for regulations to help ensure that workers were better informed about the hazards of chemicals they worked with. What is the HazCom Standard? OSHA issued the first version of the HazCom Standard back in 1983, although the applicability was limited. OSHA broadened the scope in 1987 to include all industries where employees are exposed to potentially hazardous chemicals, and revised the Standard again in 1994. The Standard, through its updates and revisions, created more detailed and specific requirements for manufacturers to label the chemical products shipped to downstream users, and for employers to maintain comprehensive hazard communication programs for the protection of workers. Still, problems remained. Manufacturers under HazCom 1994 had a great deal of latitude when it came to formatting material safety data sheets (MSDSs) and shipped labels. For example, there was no consensus on what pictograms for different kinds of hazards, such as toxic chemicals or flammable chemicals, should look like. This often caused confusion about chemical hazards, which compromised safety. An arguably even bigger problem was that MSDSs lacked a standardized format. You might’ve found contact information for the manufacturer on page 1 of the document, or you might’ve found it on page 6. Important information about physical characteristics and emergency response could be anywhere within documents that commonly reached 15 pages in length. People generally look for SDSs during emergencies, and those are exactly the times you don’t want to waste time hunting through an SDS for the information you need. Something had to change. In 1992, representatives of international government agencies and other stakeholders convened at the Conference on Environment and Development, held by the United Nations (UN). Attendees discussed the variable quality and formats of hazard communication information within their jurisdictions, and also on the even greater variability in information across jurisdictions. The lack of consistency made it difficult for employers to manage hazard communication for all of their employees, and to efficiently provide access to important chemical information. After years of development, a subcommittee of the UN published the first version of the Globally Harmonized System for Hazard Communication (GHS) in 2003. The GHS is a voluntary system for classifying hazards and developing and providing hazard information, but individual countries (or individual agencies within a jurisdiction (for instance in the U.S. GHS has been adopted by OSHA and Department of Transportation, but not yet fully by the EPA) can choose to adopt GHS by aligning their regulatory framework with its provisions. As they do so, requirements across countries continue to become more aligned. The alignment is not perfect because the UN subcommittee on GHS reviews and updates the standard every 2 years, different countries are aligned with different versions of the GHS at any given time, and they have latitude over which elements they adopt. But still, compared with the large amount of variability in the quality and presentation of hazard information in the past, GHS has been a significant improvement. OSHA was one of the most important stakeholders in the original discussions that led to the GHS, so it was no surprise that they adopted Revision 3 in 2012 through an update of the HazCom Standard. There were several major changes that came with the adoption. The way chemicals are classified changed, with additional clarity and nuance incorporated into hazard definitions. Manufacturers also have firm requirements when it comes to shipped container labels, and must ensure that all labels contain six required elements: product identifier, manufacturer identity, applicable hazard pictograms, applicable signal word (either “danger” or “warning”), hazard statement and precautionary statement. SDSs must have the required 16-section format as described in this OSHA Brief. It’s not mandatory to include information in Sections 12 through 15, but you must always include the section number and heading to show you’re using the required format. After adopting GHS via a final rule in 2012, there was a phased-in transition timeline for compliance, which was originally supposed to end in June 2016. But many manufacturers missed their deadline to reclassify their chemicals and develop new SDSs and shipped labels, which affected everyone downstream in the supply chain. Even now, there’s a chance that some of the documents for chemicals in your workplace are in the old MSDS format. And of course, new chemicals and new SDSs will keep entering your workplace, so you’ll need to be vigilant about keeping your chemical inventory and SDS library up-to-date. All of this means that while the original transition timeline for OSHA’s first alignment with GHS is now technically over, your responsibilities remain! The answer to that question depends on who you are, and what you do. If you manufacture or import chemicals, you’re responsible for classifying the hazards of those chemicals. Appendixes A and B of the Standard contain instructions you’ll need to do this. Based on that classification, you must then use information included in Appendix C to determine what hazard information, including signal words and pictograms, you’ll need to include on labels for all chemical products you ship downstream. You also need to develop SDSs for all chemical products you import or manufacture. There are 3 circumstances in which you’re required to supply SDSs. First, you must supply them with initial shipments of chemical products to downstream users. Second, you must include a new SDS with the next shipment after you revise the SDS for any reason. Third, you must send an SDS whenever requested to do so by a downstream user. As a manufacturer or importer, you’re at the top of the supply chain, and everyone downstream depends upon the accuracy of the shipped labels and SDSs you supply. That’s why it’s especially important that you get it right! The HazCom Standard defines a “distributor” as “a business, other than a chemical manufacturer or importer, which supplies hazardous chemicals to other distributors or to employers.” Basically, this means that you’re a distributor if you receive chemical products from a primary manufacturer, and then ship them to users downstream. You’re responsible for including shipped labels and SDSs with the chemicals you ship downstream. That means you should stay on top of the chemical suppliers who ship to you in order to make sure they’re sending you accurate hazard information for the products they supply. Employers are the end-users of chemicals, and have the important responsibility to ensure that their own employees have the information they need about the hazards of chemicals in the workplace. Remember the discussion about the “bad ole days” before there was a HazCom standard – what a dangerous time it was for workers? OSHA developed employer requirements under the HazCom Standard to help reduce the potential for those situations. A Written Hazard Communication Program. Consider this your “playbook” for managing HazCom at your site. That’s why it’s so important that your program is “site specific.” Resist the temptation to just download any old template from the internet and put your company’s name and address on it. You need to lay out the details of your chemical hazards, your storage practices, your workplace labeling system (more on that later!) and your training program. You also need to make sure this program is accessible to all of your employees, and that they know where to find it. Chemical Inventory List. Just like the name implies, this is a list of all of the chemical products in your workplace for which you are required to maintain SDSs. You can probably see the reason why this is a required element – you can’t communicate the hazards of chemicals in the workplace to your employees if you don’t know what chemicals you have. As you bring new chemicals into the workplace, make sure that the chemical inventory list is kept up to date. Proper Labels and Warnings. Employers must ensure that shipped labels on incoming containers are not removed or defaced. But there are plenty of containers in the workplace other than the initial shipped containers -- including transfer buckets, spray bottles, drip pans beneath equipment, and reservoirs for hydraulic oil and coolant within machines – and OSHA requires you to make sure those containers are labeled, too! Your system for labeling and communicating the hazards of chemicals in these kinds of secondary containers is called workplace labeling. SDSs and Right-to-Know Access. The whole purpose of the HazCom Standard is to protect workers who are exposed to hazardous chemicals. It shouldn’t be a surprise that one of the most central responsibilities of an employer is to ensure their workforce can access the SDSs for chemicals they work with during their workshifts. The key is that they must have access to the exact documents for the exact chemicals they work with, which means you have to maintain the SDS for the chemicals provided by the manufacturer, rather than “generic” SDSs. You also can’t have any barriers to access. For example, if you keep your SDS library in a supervisor’s office, and that supervisor then goes to lunch and locks her office door, employees would not be able to obtain the SDS in the event of an emergency. A cloud-based SDS management system can help provide the 24/7 you and your workforce need. Of course, none of the efforts you make to manage HazCom will bear fruit if your employees don’t understand the Standard, or the specific details of your HazCom program. That means you’ll need to train them, and more importantly, you’ll need to verify that they’ve understood their training. OK, Good to Know. But Where Do I Start? Everything starts with knowing what chemicals you have in the workplace. Make sure your chemical inventory is up to date, and doesn’t have any gaps due to chemical products that may have “snuck in” one way or another! Having good communications with your department supervisors and an active inspection program will definitely help with this. Another good place to start is with your written HazCom plan. Surprisingly, many employers don’t take development and maintenance of the HazCom Plan as seriously as they should, and deficiencies in the Written Plan account for many of the violations OSHA issues for HazCom. The plan is needs to be a “playbook” describing your methods for managing your chemical hazards, so it needs to be site-specific, and up to date with current practices. For now, we’ll also point you to one more area: training. Make sure you’re not only training all your employees before they work with hazardous chemicals, but also updating the training whenever anything significant about your chemical hazards and management practices change, or whenever you see evidence that employees have not understood the training. OSHA emphasizes that the fact that you’ve provided the training doesn’t in itself mean you’ve met your obligation – you also need to be sure that employees have understood what you’ve taught them. Make it standard practice to allow your employees to ask questions during training and to evaluate their understanding of HazCom, not just immediately after the training but on a recurring basis during normal workdays. Click here to continue on to "Intro to Hazard Communication, Part Two" and learn more about how you can better manage your HazCom compliance. Until next time, enjoy the journey. For additional information to help you understand your HazCom responsibilities, be sure to check out our resources page for guidance, as well as white papers & guides and webinars. We have solutions that can help you with your most important HazCom management tasks. Our MSDSonline SDS & Chemical Management platform can give you visibility of all chemicals in your inventory, making it easy to give your entire workforce access to SDSs anytime, anywhere. Chemical ingredient indexing helps you understand what’s in your chemical products and flag ingredients subject to regulatory requirements. You’ll also be able to print labels for chemical containers easier than ever before, ensuring that your employees always have the hazard information they need to work safely. Do you need help completing or updating your chemical inventory? Let us do the hard work by using our On-Site Chemical Inventory Audit service. We’ll send an experienced expert to your location to create a site-specific chemical inventory for you. During the audit process, we’ll capture each chemical Product Name, Manufacturer, and Product Code (if applicable) and where each product resides at your location, so you can get an accurate snapshot of your entire chemical footprint. If you want some help with your HazCom training program, try our on-demand training solutions. You’ll have access to updated training courses covering OSHA’s adoption of GHS and guidelines for HazCom compliance, with tracking and reporting features to simplify your training management. Are you uncertain about your SDS authoring and labeling requirements, or do you have concerns about compliance? Contact the MSDSonline Authoring Services Team to learn how we can help you. We offer expert SDS and label authoring services that let you take the time, cost and guesswork out of HazCom compliance. Combined with our comprehensive suite of Regulatory Consulting Services, including SDS Compliance Check, we’ll help you ensure your SDSs and labels are fully aligned with OSHA’s HazCom requirements. To learn more, click here or give us a call at 1.888.362.2007. EH&S Blog MSDS / Chemical Management Intro to Hazard Communication, Part One: So You’re New to HazCom?